Equipped with auto memory function and a side switch, the total length is only 2.8"
The Olight S10 is considered a pocket flashlight because of the size and weight. Weighing in at just a few ounces and not much longer than 3″, this little powerhouse puts out a whopping 320 lumens on high mode. It uses the CREE XM-L LED for the clean crisp white light. A large switch on the side of the body allows for easy switching from high, medium, low, and moonlight modes, even has a strrobe with a simple double tap. The Olight S10 Flashlight uses just one CR123 or a rechargeable RCR 123 battery. Durable anodized aluminum, a stainless steel head ring, and an ultra strong pocket clip means you can feel comfortable taking this light anywhere. The tailcap houses a strong magnet allowing for mounting to ferrous surfaces, which adds to the extreme versatility of this unique flashlight. The price is slightly more than other pocket flashlights but for the amount of lumens this thing puts out is hard bargain to pass up. The Olight S10 is one of those flashlights that is widely used for backpackers, hikers, service techs and more. 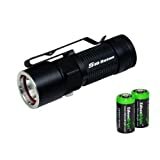 If you are looking to spend no more than $50 than this is the perfect flashlight and will service its purpose for a long time.